Quest Pharmaceuticals Pvt. Ltd. is a service oriented pharmaceutical company established in September 2001. Quest has been striving for excellence since its inception. Self-sufficiency. Excellence in quality economy. Committed to cater growing health care needs. Innovating for healthier future. These are the core values that Quest believes in and competes to standout in the pharmaceutical industry. Since Quest was founded, ‘Ethics is a must’ has remained as ‘Voice of Quest’. Alongside its ethics, Quest has achieved to be one of the pharmaceutical companies that are opening doors to a healthier nation. Active Jobs By Quest Pharmaceuticals Pvt. Ltd. 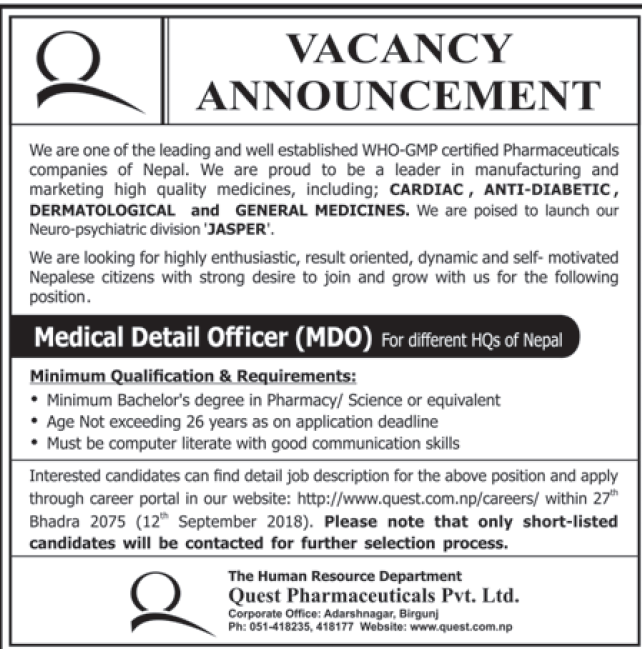 Expired Jobs By Quest Pharmaceuticals Pvt. Ltd.